Do you really want to build shining creations? That forms the basis of the Magformers Neon Led Set. 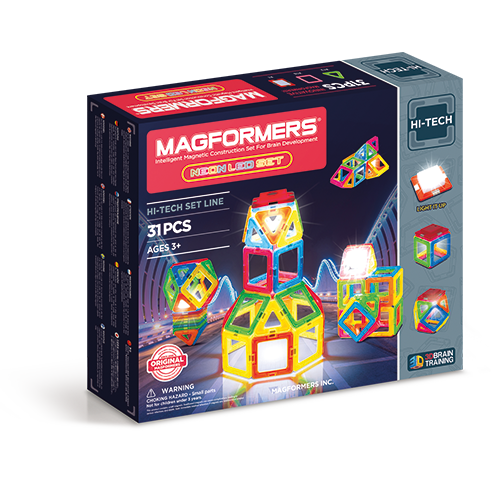 This set of magnetic toys in bright neon colors contains 30 magnetic triangles and squares and 1 special Magformers piece: a LED block that glows in different colors. With this LED block you can let your constructions shine like never before and your buildings are literally in the spotlight. You build geometric figures with unspeakable names like the Rhombic octahedron, but also luminous stars, lighthouses, a camera or even a gift box. Children from 3 years old are intrigued by the endless possibilities and the splendid colors of this luminous magnetic toy. In addition to build various constructions and the beautiful LED effects, children love to keep their creations in their room. With the simple forms of the Magformers building blocks children can create as many combinations as they can imagine, the possibilities are endless. Magformers toys not only stimulate the creativity but also the 3D thinking of children who are learning and playing at the same time. With Magformers you invest both in construction fun and the development of your child.